Due to hardware failure or planned upgrade. Moving between a physical and a virtual machine (P2V / V2P). Changing a non-raid to a raid installation or legacy SATA to AHCI SATA. Aspects of the Windows boot process can cause a boot failure after significant changes to the hardware, ReDeploy can overcome these. Discovering hardware and association with matching device drivers is time consuming and must be undertaken while windows is being installed. It is skipped during a normal Windows boot making the boot delay acceptable. Early in the boot process, the boot loader loads the Windows kernel (the core of the operating system) and the critical drivers required to get Windows up and running. If the new hardware configuration requires a new driver to read the disk containing the operating system then Windows will fail to boot. When the kernel and critical drivers are loaded, the kernel starts. The kernel and its associated hardware abstraction layer (HAL) need to match the motherboard for best enabling. Drivers are optionally loaded to handle specific central processing unit (CPU) features. For a stable system, the driver needs to match the hardware, in this example, the CPU model. 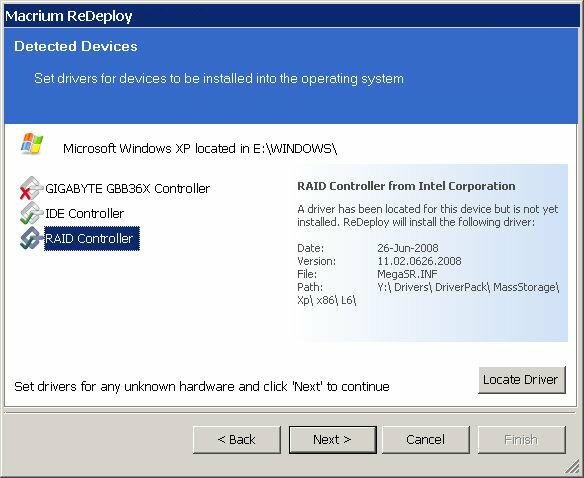 ReDeploy detects changes to critical system features, locates relevant drivers and injects them into your Windows operating system so it boots. ReDeploy makes the complex process of getting an off-line Windows operating system running, as easy and intuitive as possible. It does not, however, install the complete driver set for the new hardware. You can complete the driver installation for devices such as network and graphics adapters when your windows installation boots on your new hardware. 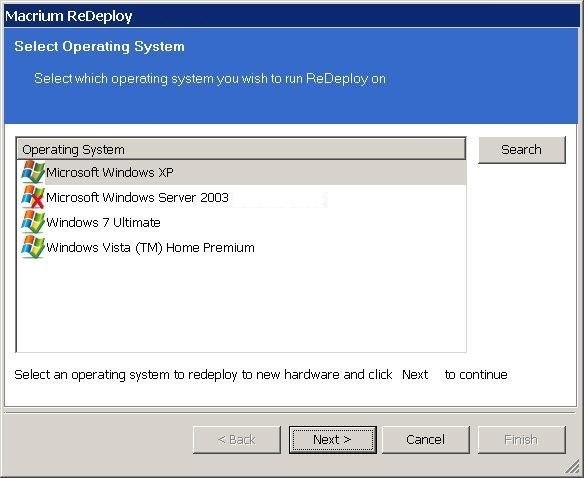 You need to run ReDeploy from the Windows PE Reflect rescue CD. This allows the new hardware to be detected and the configuration of the Windows system modified to enable it to boot. Note: To transfer to a Windows Server install to new hardware use Macrium Reflect v6 Server edition for ReDeploy. Note: ReDeploy modifies an existing offline operating system to work with new hardware. 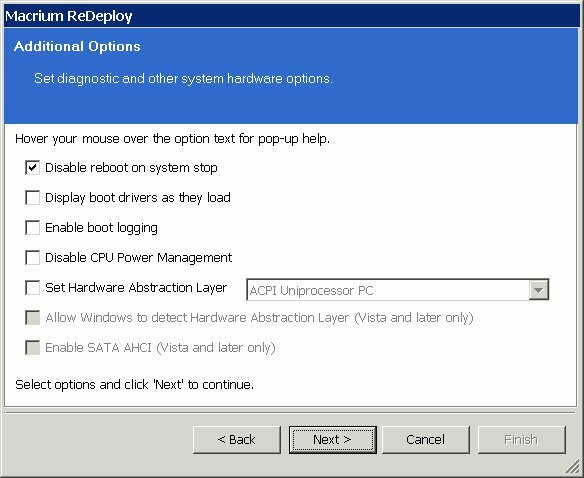 Restore your system image to the PC being deployed before running ReDeploy. There is no need to reboot your PC after restoring an Image and before you run ReDeploy. Boot the target PC with the Windows PE rescue CD or USB equivalent. (There is a link to a video on creating a Windows PE rescue CD at the bottom of this page). Click ReDeploy Restored Image to new hardware. If you have a multi-boot system, then you will be presented with a list of operating systems, select the operating system to be redeployed. Click Next. Specify driver locations for your mass storage devices (such as RAID card). If you haven't already, insert a driver disk for the hardware you are going to boot from. This will typically be the motherboard or RAID card driver CD. Click Add to add driver locations. You can also specify additional paths such as network folders. Click Map Drive to add a network share. ReDeploy searches through user specified driver locations. If none are specified or no matching drivers are found then it searches removable devices such as CD's and disk drives. ReDeploy also searches through Windows' database of drivers. 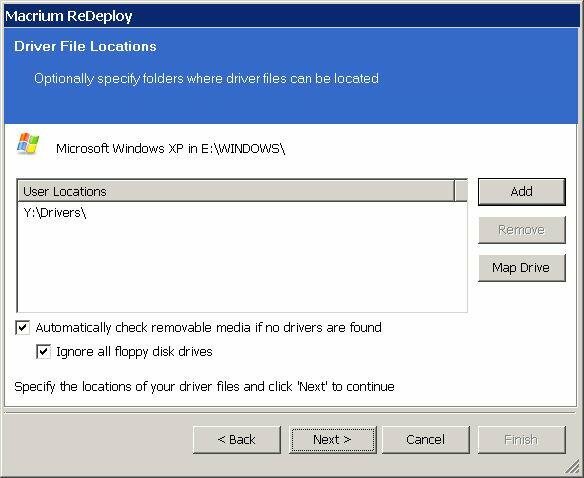 ReDeploy seeks drivers for all discovered mass storage devices and displays a list with details, Click Next. The driver is already installed. It might still need to be enabled at boot, this is done automatically. The driver is located, either from a CD, user specified path or from the Windows database. 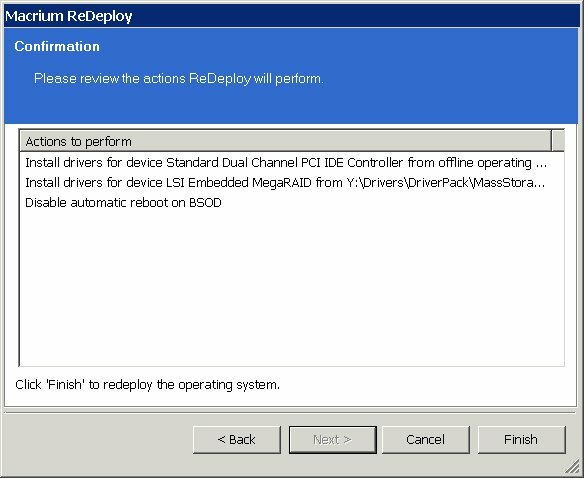 This driver is installed on completion of ReDeploy. No matching driver is located. If no driver is located, or you choose to override the displayed driver, then use locate driver to manually specify an .inf file. If you have multiple mass storage interfaces in your system, you only need to locate drivers for hardware that contains the Windows system and active partitions. Review displayed options, leaving them as default if possible. Click Next. Disable reboot on system stop Set this option to stop automatic rebooting if a blue screen of death (BSOD) occurs while Windows is loading or running. If this option is not set and Windows generates a BSOD, there will be no time to note the BSOD error codes. Display boot drivers as they load Set this option to show which drivers are being loaded as Windows loads. Once Windows is loading and running without issue this option can be reverted using the Windows MSCONFIG utility. You can use the Pause/Break key to freeze the list as it scrolls past, use space to un-pause. Enable boot logging Set this option to log drivers being loaded by Windows as it loads. The resulting log file 'ntblog.txt' can be found in the windows folder. Once Windows is loading and running without issue this option can be reverted using the Windows MSCONFIG utility. Disable CPU Driver Set this option to disable CPU drivers. This may be useful if you see BSOD's in the selected HAL drivers or system lockup on entering standby or shutdown. Set Hardware Abstraction Layer Set this option to choose which Hardware Abstraction Layer is to be used in the selected Windows operating system. The recommended HAL for this machine is the one initially selected. If you have the incorrect HAL configured, your Windows installation is unstable and can cause random BSOD's or lock ups after Windows boots. In particular, if you are redeploying from or to Virtual Box with an advanced programmable interrupt controller (APIC) unchecked (the default) or very old physical hardware, set a new HAL. Set this option to allow Windows to determine the best Hardware Abstraction Layer to use at boot time. This is a Vista and later only option. Set this option to enable support for generic SATA AHCI hardware. You will typically also need to enable an option in your BIOS for your mass storage hardware to operate in this mode. This is a Vista and later only option. Review the actions to be be performed and click Finish to apply them to the target operating system. A log file ReDeploy.log saves to the drive containing the redeployed operating system. After clicking Finish to inject drivers and apply your settings you see a confirmation dialog, and you can reboot your OS which should now be compatible with your new hardware. Note: Check there is a tick in the checkbox against Check for unsupported devices each time the rescue media loads before burning the Windows PE rescue CD, so that you can add additional drivers when you boot on new hardware.